Salt water pools FAQ (Frequently Asked Questions). 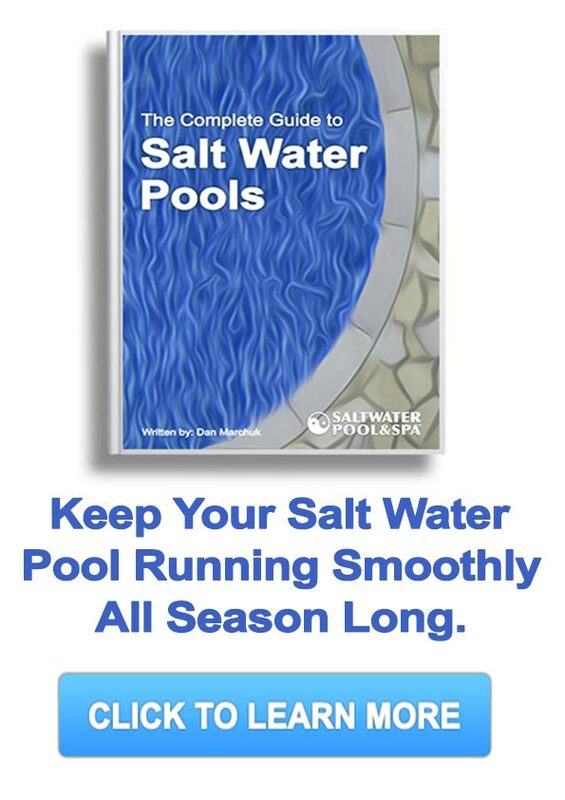 We'll go over answers to the most common questions related to salt water pools. If you are experiencing negative effects from a chemical chlorine pool or have questions about how a salt water system you'll find answers below. It's simple to convert an existing pool to salt water and you will be joining millions of pool owners around the world who have made the change. A salt water pool is similar to a regular chemical chlorine pool except for a few important differences. The salt water system or chlorine generator produces chlorine naturally from the salt in the water that is broken down through the process of electrolytic conversion. The amount of chlorine is lower and combined with the low levels of salt you won't experience red eyes, itchy skin or the sense that you were swimming in a chemical bath. You can also expect to spend less time balancing chemicals because a salt water pool is easier to maintain and produce healthy pool water. How much salt is in a salt water pool? You might be surprised to know that the concentration of salt is less than what you find in your own tears. It's also so low that you won't taste it or smell it but you will feel how soft and refreshing it feels on your skin. The salt concentration in a salt water pool is between 2500-4500 ppm compared to twice the amount of 9,000 ppm of human tears. When you compare it to the 35,000 ppm found in the Pacific ocean you get a sense of how low it actually is. If you want to calculate how much salt your pool would require to convert it to a salt water pool visit our pool salt page. How much does a salt water system cost? A salt water system can be used in both in-ground and above-ground pools of just about any size. The cost of a salt system can range anywhere from $300 to $1500 depending on the model and additional features. The initial cost of the system and salt are usually recouped by pool owners after only a few years due to using less balancing chemicals and the the elimination of chemical chlorine. In addition to saving hundreds of dollars a year you'll be experiencing the best swimming experience available today. The average cost to use factory produced chlorine is about $3 per pound while the cost to produce chlorine automatically in the salt cell is about $1 per pound. These savings add up fast and with all the added components to store-bought chlorine it makes it even less appealing. If you would like more information on chlorine purity and cost comparisons read Hayward - Lessons in Chlorine Purity. Can I convert my existing pool to a salt water pool? Yes! In most cases there is absolutely no issues with introducing a salt system to your existing pool. The addition of a chlorine generator will actually lead to more stable water chemistry and cause less stress on your existing system. If you want to learn more about how to convert your pool to salt water so you can experience all of the amazing benefits read our salt water pool conversion page with information and step by step instructions. Will salt corrode or damage anything in my pool? The salt concentration in a salt water pool is so low that the water is still classified as fresh water. The levels of salt are so low in systems available today that damage to hardware or corrosion to adjacent decks is almost non existent. In some cases if your pool deck is made of a porous material you can experience some degrading over time but a sacrificial zinc anode is an effective tool to be absolutely certain no damage is done to metal hardware or components. The main culprit of corrosion in any pool whether it's salt water or not is a drop in pH which can can be prevented by keeping your pool balanced properly. In salt water pool the pH tends to rise so it is important that you keep the pH balanced and monitored regularly. Is it just like swimming in the ocean? Other than both feeling refreshing they are quite different. The salt concentration in the ocean is about 35,000 parts per million and in a salt water swimming pool it is kept around 3,000 parts per million. The salt level is so low it's still classified as fresh water and you can't taste or smell the salt in a properly balanced pool. Will my new salt water pool require more maintenance? Salt water is actually more stable and balanced and you will notice a remarkable drop in time spent balancing the water. Most salt systems have a built in monitor that displays salt and stabilizer levels so you don't have to test as often. This means you will spend less time and money on chemicals and have more time to enjoy your pool. How will my allergies be affected? Most people with chlorine allergies or a chlorine sensitivity report that salt water makes their allergies completely disappear. If you want to learn more check out our page that talks about chlorine allergy. Will salt make my skin feel sticky or smell? It's actually quite the opposite. The salt water will leave you feeling refreshed and your skin soft and silky instead of feeling like you just had a chemical bath in chlorine. There is virtually no odour and you won't smell the chlorine when you are swimming. If you want to learn more about chlorine be sure to read our information page discussing what chlorine is. Is it safe to swim with dyed hair or bright coloured clothing? Absolutely! The chlorine levels are so low that your hair won't bleach and is safe for most hair dyes. You can also count on keeping your bathing suits nice and bright without them fading over time. Do I still need to add chlorine? You should never have to add chlorine again or handle the chemical. One of the benefits of a salt water pool is that pool salt is converted to natural chlorine. The salt cell continuously replenishes the necessary levels of chlorine by breaking down the salt that is already in your pool water. Will my eyes still get red and itchy? No! That is one of the many benefits of salt water pools because the water is gentle on your skin, hair, eyes and clothing. Many salt water pool owners find that their chlorine rash symptoms are alleviated after upgrading to salt water. Are salt water pools expensive to maintain? You will spend less money maintaining a salt water pool because you won't have to buy chlorine tabs and a lot less other balancing chemicals. You will spend about half the time balancing your water than you did with a traditional chlorine pool. The salt cell in chlorine generator will need cleaning once a year and will last about 5 years. Will the salt damage my vinyl liner? A salt water pool system will actually increase the life of your vinyl liner due to the much lower levels of chlorine. When I backwash will the salt water harm my lawn or garden? No. The low concentration of salt in the water and the lower levels of chlorine will be gentler on your lawn than a traditional chlorine pool. How do I increase the free chlorine level in my salt water pool? There are a few different reasons why your free chlorine level is low and the salt system can't seem to get it to the required 1 - 3 ppm. Check to make sure that your chemistry levels are balanced and within recommended range including Salinity and Stabilizer. If you don't have the recommended salinity for your model of salt generator the cell can't convert enough salt into chlorine. Low Stabilizer levels can cause the chlorine to burn off and you can lose up to 90% of the chlorine in your pool. The salt cell may need cleaning or need to be replaced. A cell that has excess scale buildup will be less effective at producing chlorine. You may not be circulating enough water at a high enough rate due to clogged piping or inadequate flow rate. A salt water pool is healthiest when the pump is running 24 hours a day. A variable speed pump is recommended to lower electrical costs. If everything else fails you will need to shock your pool with a dose of liquid chlorine to boost levels up. This can sometimes be required at the start of the season or after high usage. Contact Us and speak to one of our salt water specialists if you have any further questions related to salt water pools FAQ.